This juicy goodness contains 92% water in addition to nutritious-y juicy bits, which contains vitamins A, B6 and C, antioxidants, amino acids, potassium, fiber and lycopene respectively. It contains zero fat and zero sodium. An average cup contains just 40 calories!!! Just 40 calories!!! Vitamin A promotes healthy skin and hair; Lycopene promotes heart and bone health and is also a potent antioxidant. Amino acid promotes healthy blood flow, hence generally better cardiovascular health. The water content helps you stay hydrated, which is especially suitable for our tropical climate. The fiber maintains a healthy digestive system. Interestingly enough, research has shown that ingesting watermelon prior to an intense workout session aids in the reduction of that dreaded next day’s muscle soreness and also improves your heart rate. 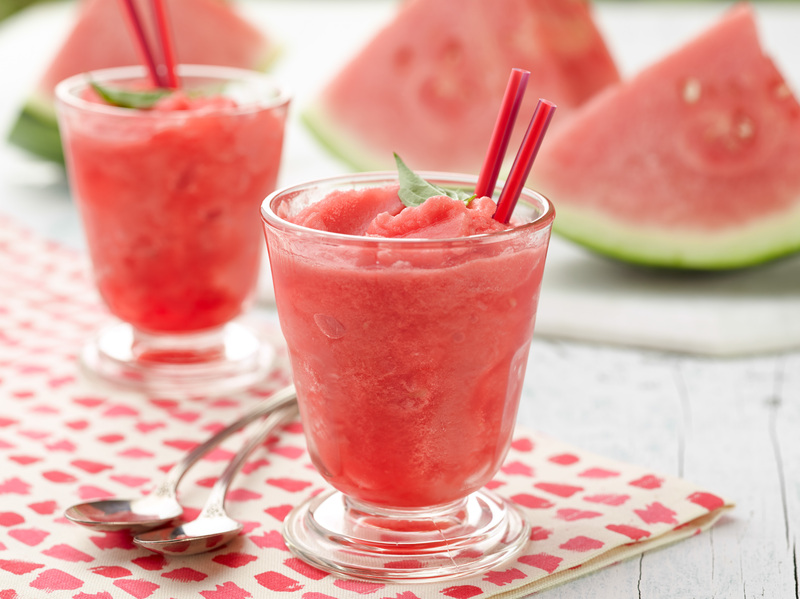 Now, let’s give you one simple watermelon recipe to try at home. Combine the sugar with 1 cup of water in a small sauce pot. Bring the mixture to a gentle boil and cook for 2 minutes. Remove from the heat and pour into a heat safe glass. Place in the fridge to cool. To the large bowl, add the remaining 2 cups of water, lemon juice and the sugar water from the fridge. Whisk to combine. Taste. Add more water if it is too sweet for your liking. Pour into glass jugs and store in the fridge. Before drinking, make sure to shake the lemonade up. Add the ice and pink lemonade to a blender and blend until chunky smooth. Add the mint or basil if using, taste and add more lemonade if desired.